The average score of the managers in GW24 was 79 taking into account point deductions for extra transfers. That’s compared to the game average of 65. That’s 14 points and 22% above the game average score. High score of the 10 was 121. The low score was 49. A mammoth spread of 72 even for a high scoring gameweek. The average overall rank of the top 10 FPL managers is 35k a worsening of rank from last week of 1k. The best overall rank is now around the top 500 and the lowest 111k. You can see my score and rank in the early FFGeek team article which I’ll do today. The top 10k captain choice (from the excellent free site FPL discovery) was 39% Sane and 29% Aguero. The FFGeek poll this time was very different to the top 10k. Not done this week sorry. 2 have used their triple captain chip in this week. Both for Aguero. None have used the free hit or bench boost chip. There are a number of options on where to use the chip this season so see my latest double and blanks article on where these are likely to be and some strategy options. The top 10k average score was 72 compared to the 10 top managers average of 79. Here’s a team which tries to make a combination from the most represented players. Please note that it is meant to be a menu of players to help you choose your transfer rather than a realistic team and it’s value is nothing like achievable. Doherty (Wolves defence represented 14 times in the 10 FPL managers teams). Richarlison (owned by 8 of the 10 FPL managers) but with a blank in GW27 and 1 return in the last 7 games likely to be sold en masse. So that’s 5 essentials and 2 maybes. This leaves room for 10 differentials/bench two pointers. 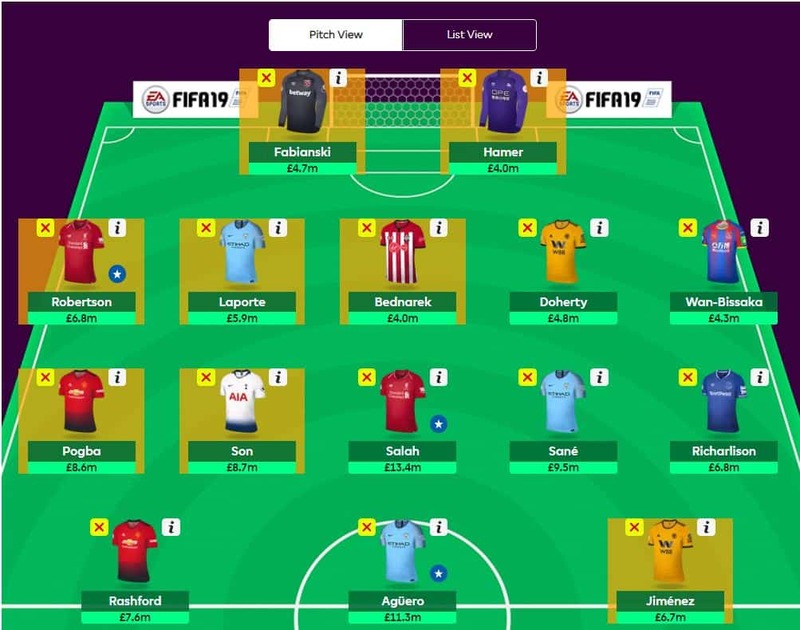 We’re currently in a period where the template is lower than ever and there are multiple theories on how to deal with the double gameweeks and blanks.